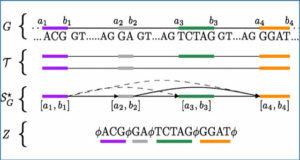 Alternative splicing events (ASEs) are prevalent in the transcriptome of eukaryotic species and are known to influence many biological phenomena. The identification and quantification of these events are crucial for a better understanding of biological processes. Next-generation DNA sequencing technologies have allowed deep characterization of transcriptomes and made it possible to address these issues. ASEs analysis, however, represents a challenging task especially when many different samples need to be compared. Some popular tools for the analysis of ASEs are known to report thousands of events without annotations and/or graphical representations. 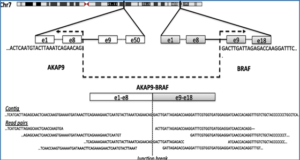 A new tool for the identification and visualization of ASEs is here described, which can be used by biologists without a solid bioinformatics background. 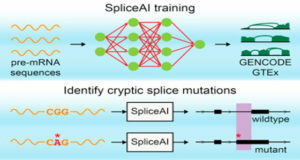 A software suite named Splicing Express was created to perform ASEs analysis from transcriptome sequencing data derived from next-generation DNA sequencing platforms. Its major goal is to serve the needs of biomedical researchers who do not have bioinformatics skills. 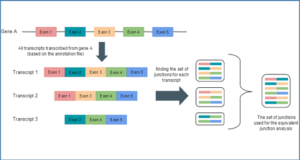 Splicing Express performs automatic annotation of transcriptome data (GTF files) using gene coordinates available from the UCSC genome browser and allows the analysis of data from all available species. The identification of ASEs is done by a known algorithm previously implemented in another tool named Splooce. 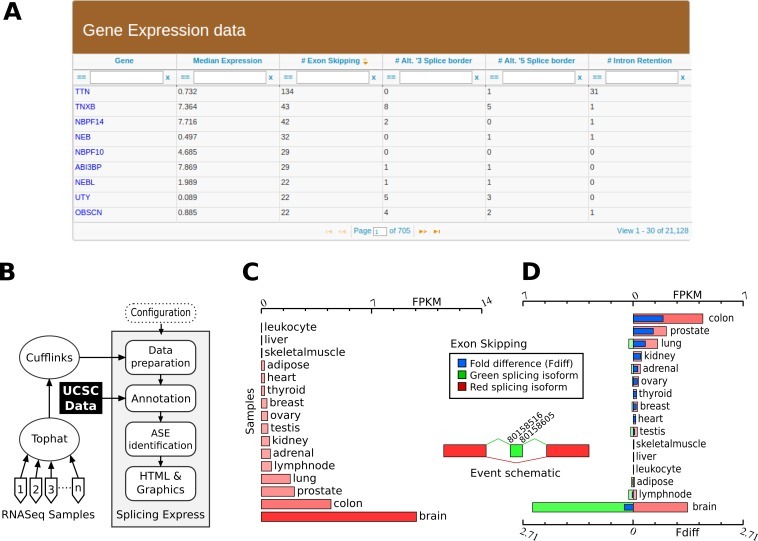 As a final result, Splicing Express creates a set of HTML files composed of graphics and tables designed to describe the expression profile of ASEs among all analyzed samples. By using RNA-Seq data from the Illumina Human Body Map and the Rat Body Map, the developers show that Splicing Express is able to perform all tasks in a straightforward way, identifying well-known specific events. Overview of Splicing Express features. (A) Table generated by Splicing Express showing expression level and number of variants in a gene-by-gene basis. (B) Schematic representation of the computational pipeline used by Splicing Express. (C) Graphic represention of the expression pattern of NRXN3. 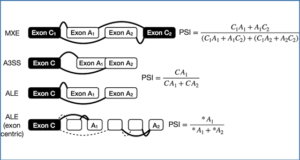 (D) Graphic represention of the differential expression of one isoform (exon skipping) of NRXN3. The exon skipping isoform is represented in red, while the isoform including the respective exon is colored in green. 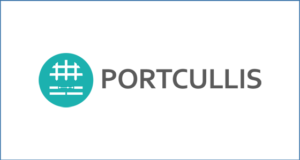 Availability – Splicing Express is written in Perl and is suitable to run only in UNIX-like systems. More details can be found at: http://www.bioinformatics-brazil.org/splicingexpress.